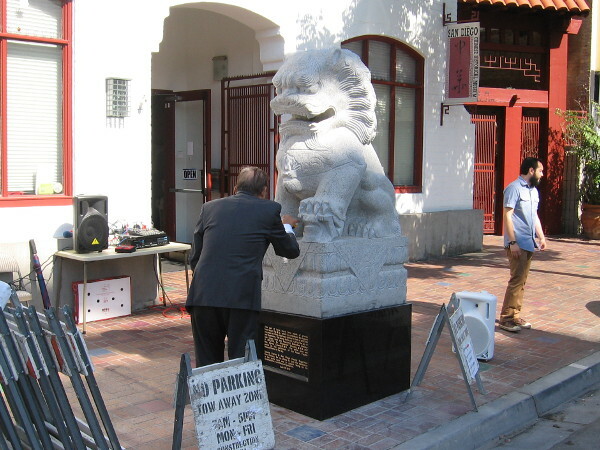 Carved stone Chinese lions unveiled in San Diego! – Cool San Diego Sights! 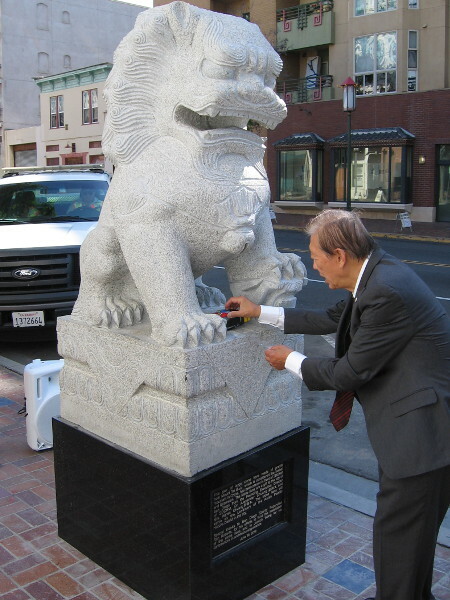 Founder of the San Diego Chinese Historical Museum, Dr. Alexander Chuang, prepares one of two stone lions for their unveiling ceremony. This morning a ceremony was held in front of the San Diego Chinese Historical Museum. Two large stone lions were unveiled at the intersection of J Street and Third Avenue. That’s in the very heart of downtown’s Asian Pacific Historic District. I missed the unveiling, because I had a long-reserved ticket for another nearby event which took place at the exact same time. But I did get photos of the two amazing sculptures being prepared! 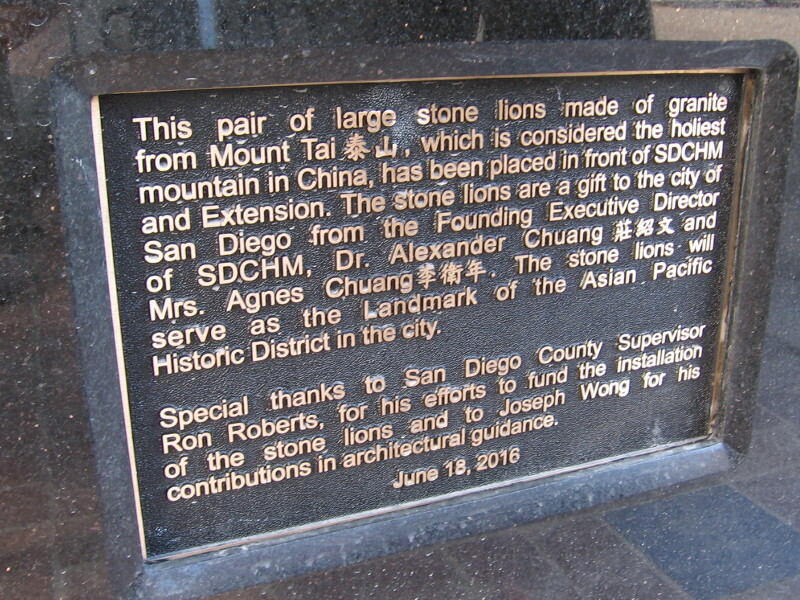 The founder of the Chinese Historical Museum, Dr. Alexander Chuang, had the two beautiful lions made in China then brought to the City of San Diego. It was a generous gift and a wonderful addition to our diverse city. I was told Dr. Chuang spent 7 or 8 years on this project. The lions are carved from stone taken from Mount Tai, which is said to be the holiest mountain in China. Now I have yet another reason to look forward to walks through this fascinating part of downtown San Diego! I briefly spoke to Dr. Alexander Chuang while he prepared the statues, and to other members of the museum. They were so very gracious! One day I’ll venture into the museum–it’s on my list of things to do. When I do, I’ll definitely share the experience. 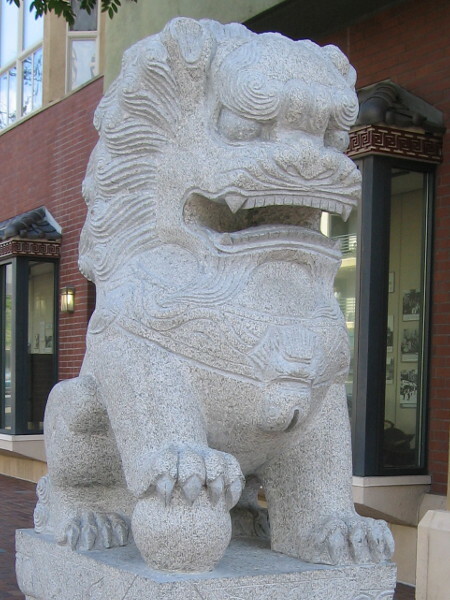 Plaque describes pair of large stone lions made of granite from Mount Tai, considered the holiest mountain in China. They will be a landmark of the Asian Pacific Historic District of San Diego. Final preparations are made about an hour before the unveiling. I got a sneak peek just by walking around with my camera! 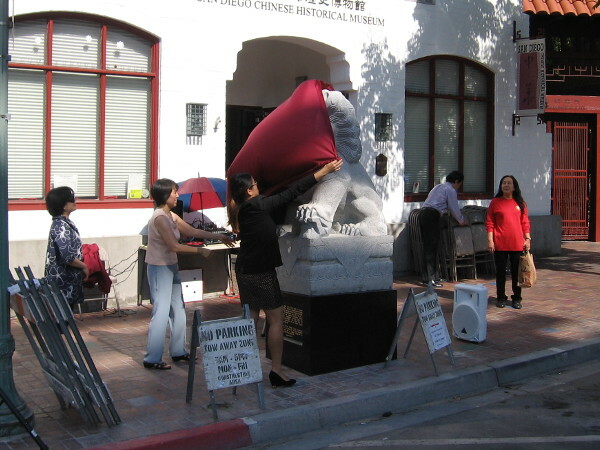 Members of the San Diego Chinese Historical Museum drape one of the two stone lions. I got my early photos just in time! On the opposite side of Third Avenue, the second lion stands guard. Another very cool sight has been added to the city of San Diego! You can easily explore Cool San Diego Sights by using the search box on my blog’s sidebar. Or click a tag! There are thousands upon thousands of fun photos for you to enjoy! Previous Previous post: Public art “Tide” rises in plaza by Marriott Marquis! Next Next post: Photos of Shakespeare’s First Folio exhibit in San Diego.